Some private hire duties with heritage buses involve driving many miles to reach a far-distant destination. On others, the destination is just around the corner. For this job, it was both. According to my Work Ticket, the destination was about a mile from the Crosville garage – Weston-super-Mare seafront. The only snag was, I had to drive to Keynsham first! The occasion was a birthday bash for a chap who was celebrating his big Five-O and that of a little girl of seven. They and a party of folk including friends and family had booked the bus for a trip to the seaside and so I drove the 26 miles to Keynsham at the stately speed of 30mph to pick them up. Apparently many of them were members of a local VW Campervan (often referred to as a ‘bus’) club, so were delighted to see the Bristol Lodekka turn into the car park to meet them. Prior to this I had no idea what kind of event they were going to so, as soon as I learned that birthdays were involved, I set the destination blinds appropriately! On the way there with the empty bus I nearly had a panicky moment when I was confronted by ‘Road Closed’ signs on one of the main roads through the Bristol suburbs. Fortunately I had driven along a parallel residential road on a previous private hire job so I was able to continue my journey with a hastily chosen Plan B. By the time everyone had boarded we had half a bus-load. Understandably they all decided to travel on the top deck and, as we picked our way through the busy centre of Keynsham, I wondered whether this would affect the handling of the bus. I needn’t have worried. Lodekkas, in common with most double deck bus designs, have a low centre of gravity so I barely noticed that everyone was up top. I had warned them about the detour around the byways of Hartcliffe but discovered as we rejoined the main road that I needn’t have bothered because the closure only affected east-bound traffic! End of the road for bus terminii? In the good old days, or so I’m told, bus conductors used to call out “Terminus!” when their bus reached its destination whereupon any remaining passengers would alight. These days, it would seem, Mr Progress is shouting “Terminus!” at terminii up and down the country, signifying the closure of once-busy transport hubs in our town centres. So, just for old times’ sake, here is a photograph of a bus station in its heyday. 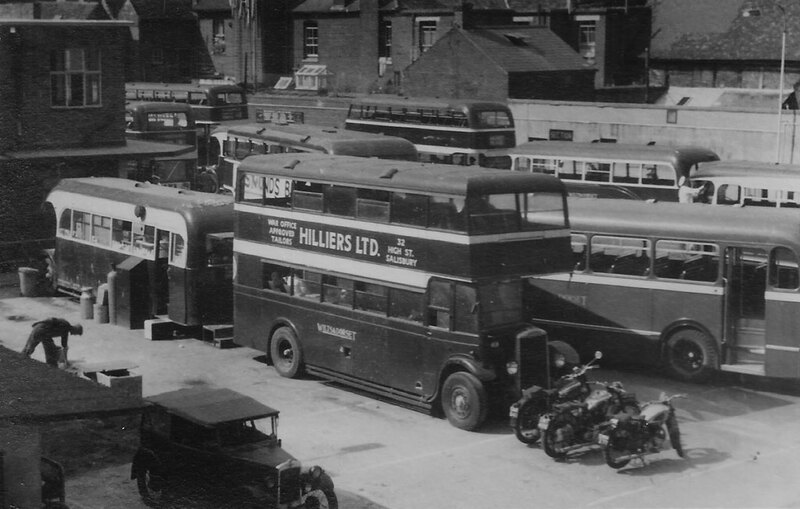 This is Salisbury Bus Station, taken by my father in about 1954 from his office window. Just like me when I worked for the Express & Echo newspaper in Exeter, my Dad enjoyed a fine view while supposedly at work! In his case he was learning the ropes as an architectural technician at Rawlence & Squarey. The notes accompanying this photo state that the two buses in the foreground were at the time being used as a canteen and staff restroom. 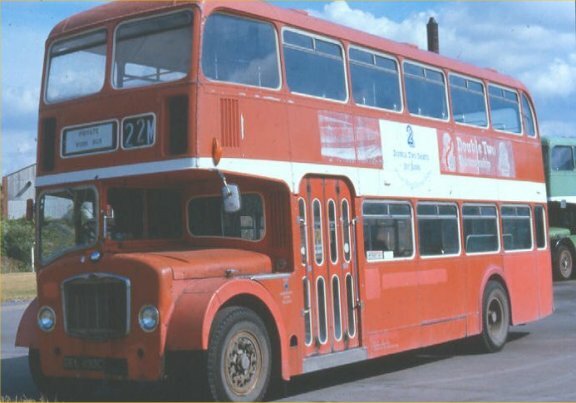 The double deck bus is Wilts & Dorset no 20 (ex-Southdown 920), a Leyland TD1 with a Willowbrook body. It originally carried a Short Bros body. Fast forward 60 years and Salisbury Bus Station closed in January 2014. I was there, regular readers will recall. With a tear in my eye, I led a cavalcade of historic Wilts & Dorset buses on the last ever scheduled departure. In this rather shaky clip (fast forward to 14:15) I’m driving the leading Lodekka. On the same day Amesbury Bus Station closed. 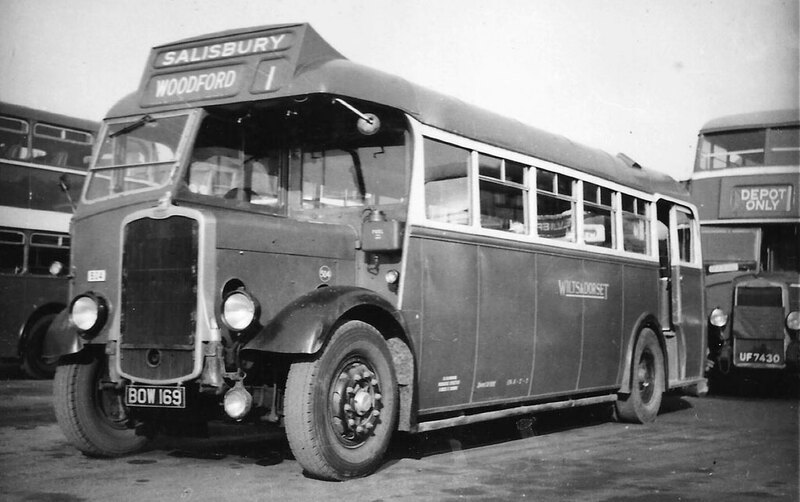 Salisbury Reds, the present-day operator of bus services in the area, could no longer justify the cost of maintaining the crumbling and outdated structures. Services now arrive and depart from various stops around the city centre. How times have changed. Crosville Motor Services in Weston-super-Mare has recently acquired a 1938 Bristol L5G, originally Southern National 280 (ETT946). Although it originally had a Mumford body, Crosville’s example now has a Beadle 36-seat body similar to one I’ve featured here before. Wilts & Dorset 504, a 1938 Bristol J (pictured below), also had a Beadle body and was transferred from Hants & Dorset in 1952, according to the notes in my Dad’s photo album. As you will see from the photo of ETT946, it has managed to retain its original high-mounted radiator in common with only a handful of surviving Bristol L buses. Usually these were replaced by the later PV2 radiator when re-bodied. This example has been in private ownership for many years, spending most of the last decade at Winkleigh with the West of England Transport Collection. I’m grateful to Les Eddy for his permission to use the photograph at the top of this post. The bus has seen better days and, although restored many years ago, will need a thorough re-restoration before it can join the active Heritage Fleet at Crosville. It will have to wait its turn in the queue! One day it should look a bit like this fine example, a 1940 Beadle-bodied Bristol L5G from the Western National fleet. Apparently the bus is still driveable and it may make the journey to Somerset under its own power. I’ve volunteered for that job but a fair amount of preparation will need to be done before it is fit for the road. Watch this space! I seem to have done a fair bit of delivery driving recently. I wrote a while ago about taking the Sightseeing Tours Bristol LH charabanc to Exeter and back for some attention to the paintwork. I also drove an open top Leyland PD2/3 to Plymouth and back for the same operator for some mechanical repairs and servicing. 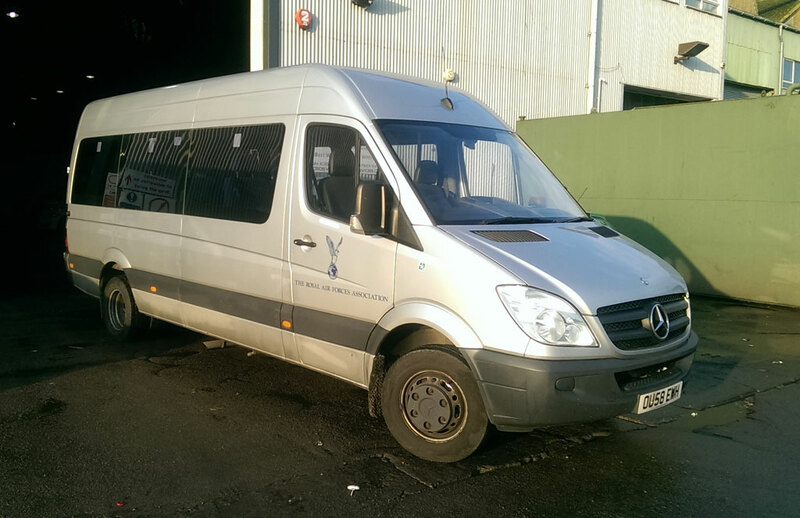 Probably my last driving duty for 2015 will be to return a 2009 Mercedes Sprinter minibus from Stoke-on-Trent after some attention by Reliance Bus Works. I drove it up last week and the trip was comfortable and trouble-free, which contrasts starkly with some of the delivery journeys I’ve done with more elderly vehicles! 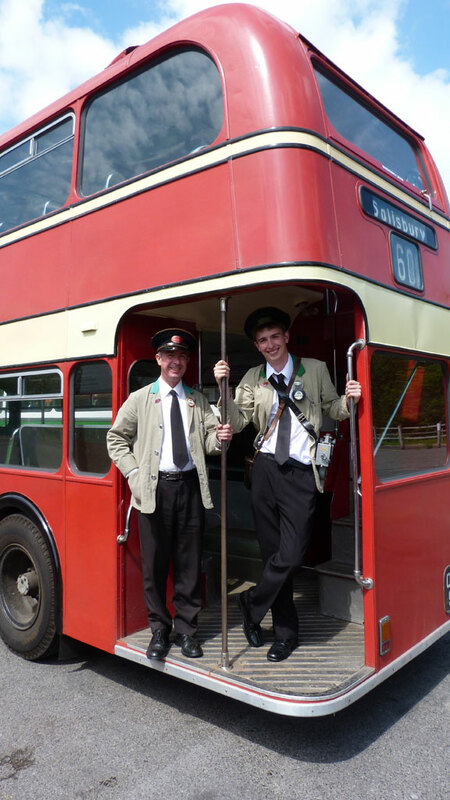 I recently took part in the vintage bus running day to commemorate the Wilts & Dorset Centenary. It also gave me the opportunity to relive some of my childhood memories in Salisbury. 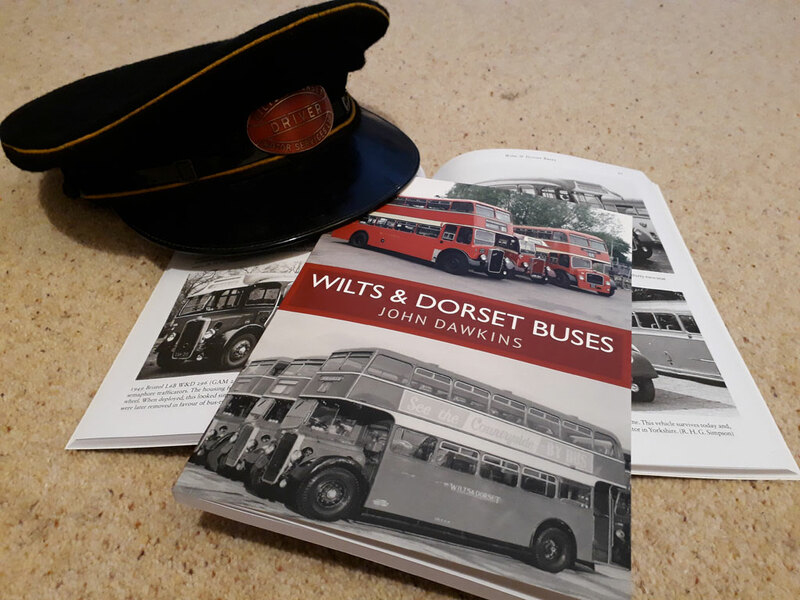 Wilts & Dorset Motor Services Ltd was incorporated in 1915 and the centenary of that event was celebrated in great style in Salisbury, with more than 50 buses operating old W&D routes or on static display. 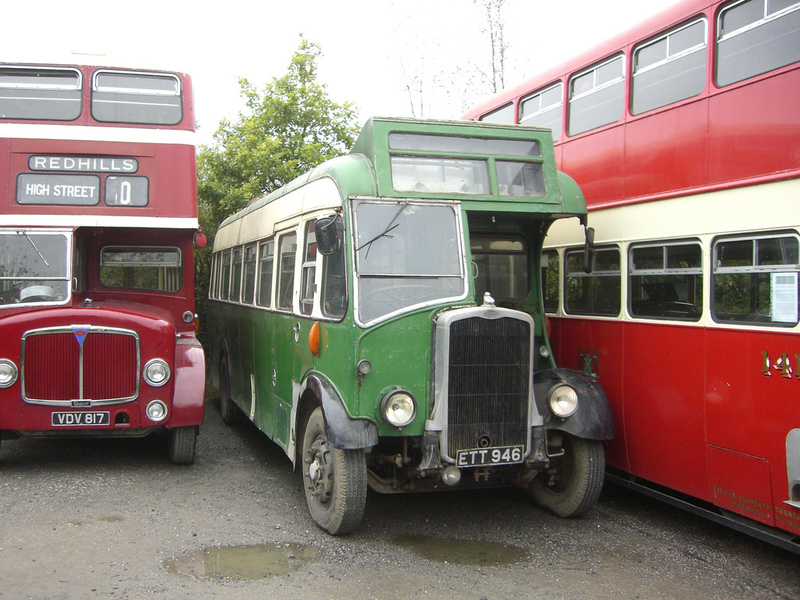 The day ended with all the surviving Wilts & Dorset buses at the event being posed together for photographs (see above). I had originally planned to take a Hants & Dorset Bristol K6A – now owned by Crosville Motor Services – to the event but the bus is still undergoing refurbishment so that plan fell through. 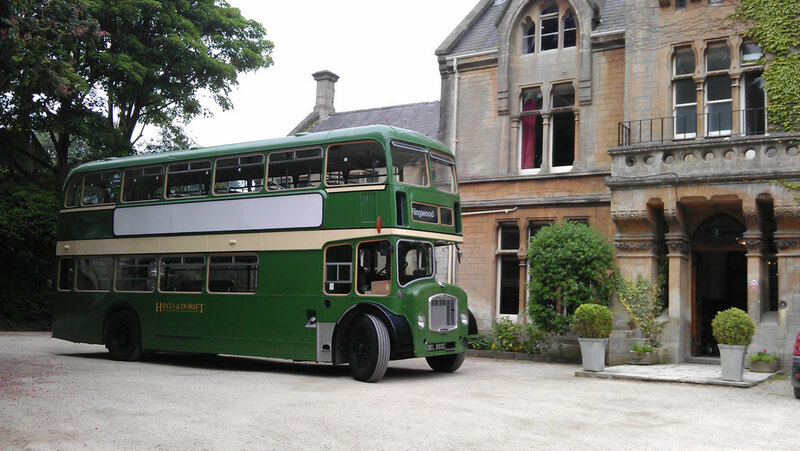 Knowing that I was available but had no bus to drive, the event organisers invited me to drive Wilts & Dorset 628 (1956-built Bristol LD6G OHR919) instead. Of course, I leapt at the chance, having enjoyed driving it at the Salisbury Bus Station Closure event in January 2014. The day started at silly-o’clock, when my alarm went off. With my son Peter for company (he was also to be my conductor for the day) I set off for Salisbury, where I had arranged to meet the owners of the bus. Allan and Kevin Lewis also own Hants & Dorset 1450 (Bristol FS6G 5677EL) and were happy for me to drive their Wilts & Dorset Lodekka while they crewed their FS. All the buses running in service began to congregate in the Millstream Approach Coach Park, along with growing numbers of photographers. Peter and I began to wonder if we’d have to join them as our bus didn’t arrive until 10 minutes before our planned departure on service. Salisbury’s one-way system was to blame! Suitably attired in our Tilling uniforms (OK, so they’re more suited to a Hants & Dorset bus, but red-trimmed jackets are as rare as hen’s teeth), we took charge of 628 and drove round to our stop on the Blue Boar Row. The sight that greeted us was amazing. Every one of the bus stops along the busy city centre street seemed to be occupied by a heritage bus of some sort. There was only just enough room for us to tuck in at the back. As soon as we drew up hordes of people rushed to board, even crossing the road from the static display area. Eventually Peter gave me two bells and we departed slowly on our first journey, which was the number 60 to Wilton. Slowly, because other buses were also departing and the crowds were spilling over from the pavements into the road. I’m sure I’ve never seen so many camera lenses pointing in my direction before! 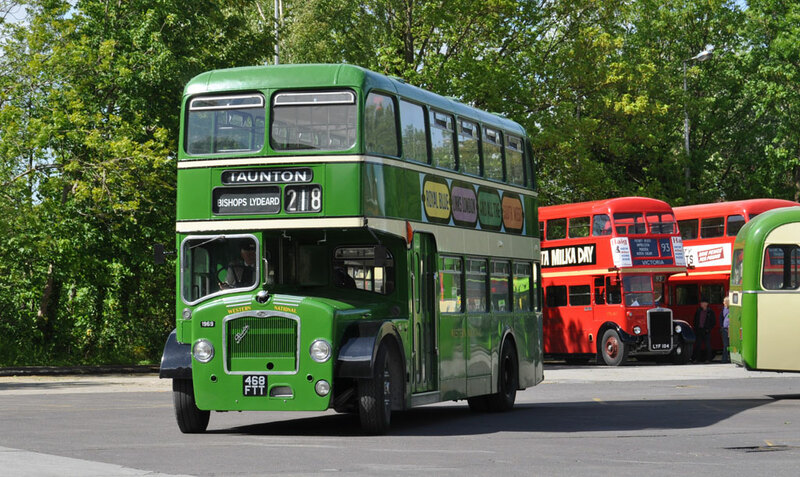 2015 looks like being a vintage year for bus running days, which seems to be the preferred format for what used to be the traditional ‘bus rally’. 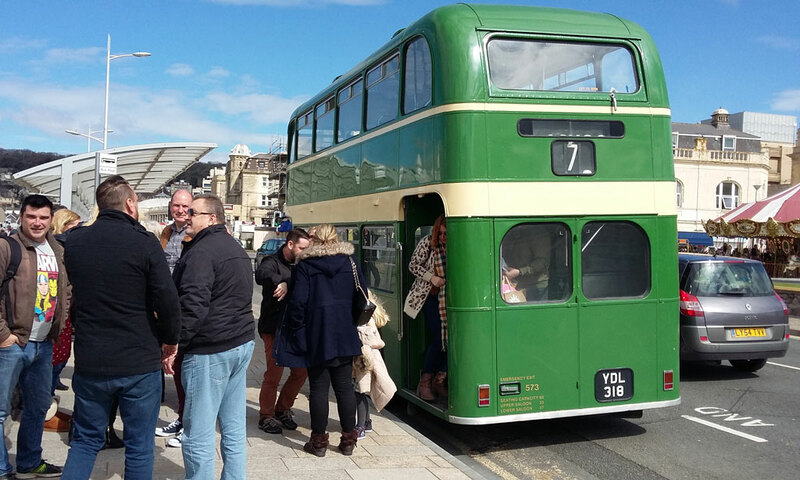 The chance to ride on buses that we remember from our youth is of course far more appealing than walking around them at a largely static display as in former years. Looking through the pages of my Bus & Coach Preservation magazine (others are available from your local newsagent) I can see that there are events up and down the country virtually all through the year. Naturally I can attend only a handful of these because they are mostly on Sundays, when I’m normally busy in church. So, for your interest, here is a list of the few events (not just running days) that I plan to be at. Plus one or two in my local area which I’d love to attend, but can’t. On Saturday May 2nd Councillor ‘Percy’ Prowse is due to attend the final public engagement of his year as Lord Mayor of Exeter. 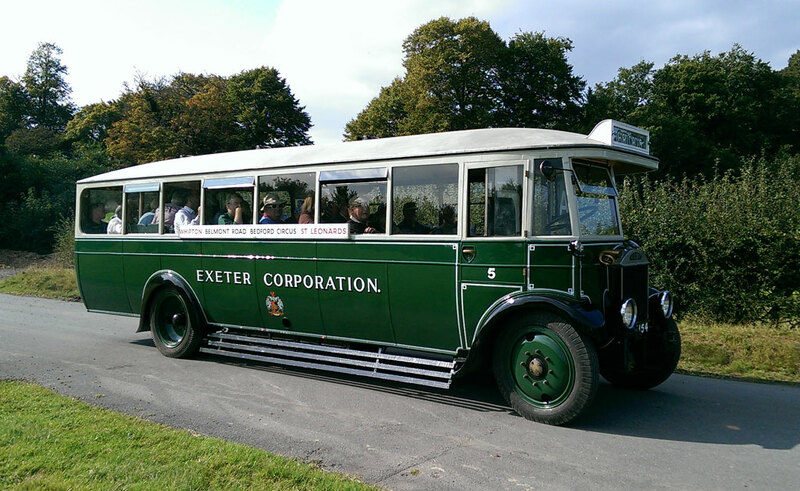 He has asked the Westcountry Historic Omnibus & Transport Trust (WHOTT) to provide a suitable vehicle for the occasion, specifically Exeter Corporation No 5 (FJ6154). This 1929 Maudslay ML3 was one of the first motor buses ordered by the Corporation to replace the trams which operated the city’s public transport. It was officially launched after restoration at last year’s WHOTT rally, with yours truly behind the wheel. I’m due to take the bus out for a proving run this week, prior to driving it from its base in mid-Devon down to Exeter under its own power. This is one event that I’m not able to attend, but am happy to list it here for westcountry folk who don’t yet know about it. 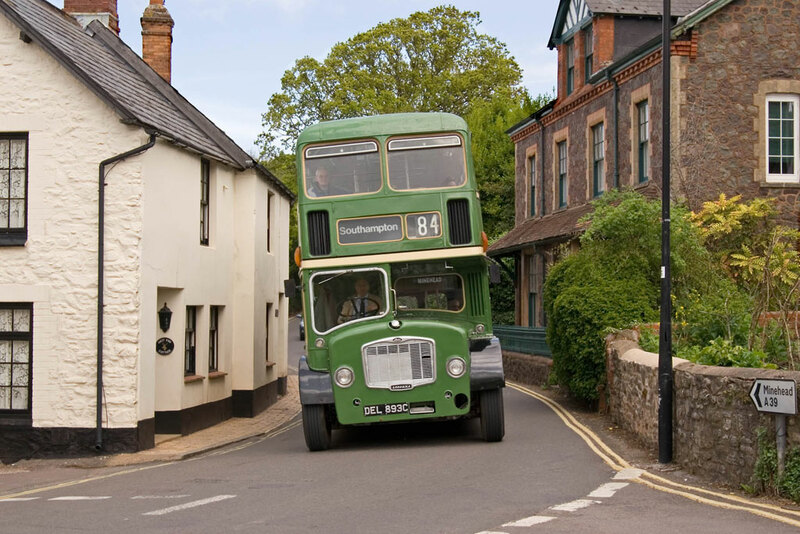 Normally run under the auspices of Quantock Motor Services, the Taunton Bus Running Day will feature most of the Quantock Heritage fleet plus a good number of visiting vehicles (photo © Ken Jones). More details on this poster. …but where is it now? 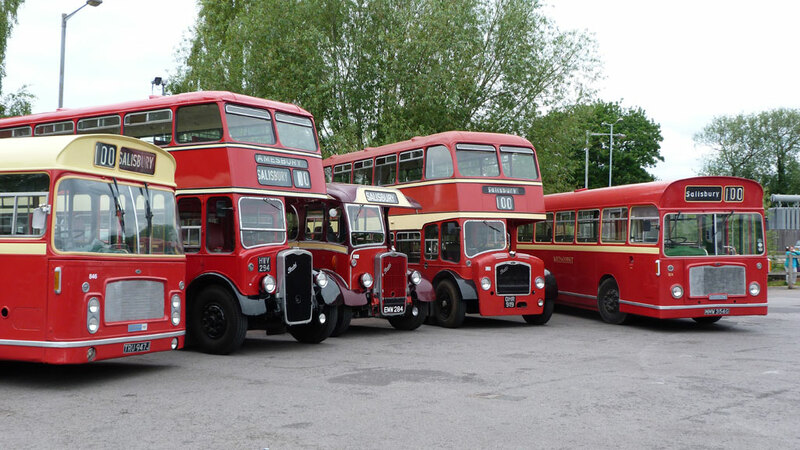 Many of the classic buses and coaches which we enjoy today owe their survival to non-PSV use after withdrawal. 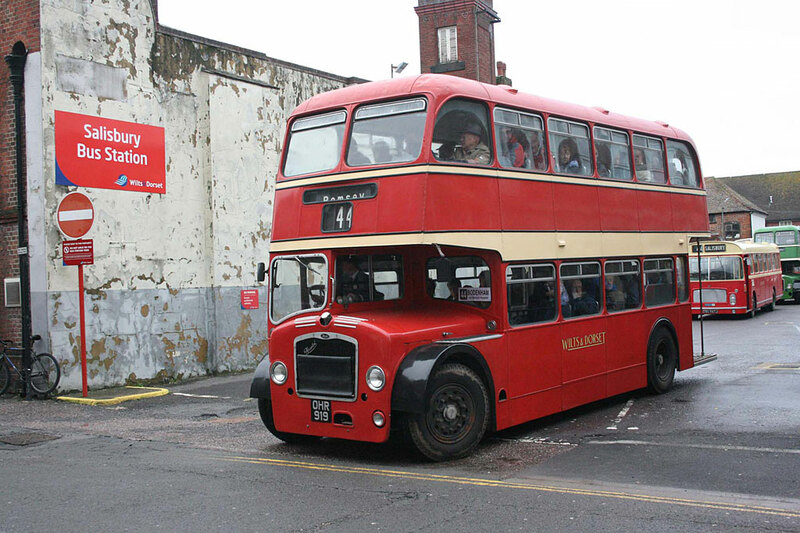 One such bus is a Bristol FLF which has featured heavily on these pages in the past. After passing through the hands of several owners, including Quantock Motor Services (left, seen entering Porlock), it reached Weston-super-Mare in the ownership of the fledgling Crosville Motor Services. It became a mainstay of the heritage hire fleet and was the first bus I drove in service after passing my PCV test in 2012.